For households that include dogs, every decorating decision becomes more complicated. The homeowners must decide if an item presents a safety hazard for the dogs or is likely to be destroyed the next time one of the pets is left alone in the house. Curtains are one of the biggest nightmares for dog owners because many dogs will eventually try to scratch, climb or pull down the curtains. Fortunately, this issue is easily solved by switching to roller blinds. They are the perfect dog-friendly choice for today’s home decorating. They are also much different from the plain white vinyl blinds of decades past. Roller shades make a dog-loving home safer because the dogs and people who live there will no longer be subjected to falling fabrics and fittings when the Roman blinds or curtains come crashing down. That’s not the only reason to replace other kinds of window coverings with roller blinds, however. These modern and beautiful blinds are also economical. They generally cost less than other treatments in the first place and they can last years, especially since they are less likely to be damaged by the four-legged members of the family. That includes cats as well. Even the highest quality curtains that are designed to last decades won’t survive an attack by a bored or angry pet, but rollers have very few places where a dog can get a good hold, reducing the chance of the blinds being damaged by the pet. Some homeowners may be concerned that roller blinds will detract from the beauty of their living spaces, but these blinds have changed greatly in recent years. Modern roller shades install easily, roll efficiently and come in a variety of colors, textures and fabrics including canvas and denim. Some can even be installed so that edges are concealed behind trim pieces for a more upscale look. Today’s blinds can withstand frequent raising and lowering without problems. These coverings rise from the bottom too, making them the right choice for the windows dogs visit most. Homeowners can simply roll them up during the day so dogs can see out and get sun, then pull them down in the evenings so everyone in the household gets a good night’s sleep. Because these window treatment options are available and made from opaque materials, it is easy to make a room completely dark which improves sleep for the people and pets. Living with dogs complicates life in my ways, but most dog lovers cannot imagine coming home to a house that does not include one or more furry friends. Most people who love dogs also do not mind making decorating choices with their dogs in mind. After all, the house is home for the dog too. Roller blinds make the perfect window covering for homes that include dogs, but they also make a good choice for homeowners who are concerned with how their window coverings look. Today’s options are beautiful, economical, pet-friendly and much different from those of years past. 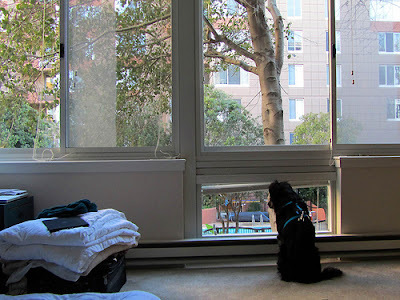 While this guest post does not necessarily reflect the views of All Things Dog Blog, it is offered as one potential solution to solving the eternal problem of broken, torn and damaged window treatments. I dream of having those fancy embedded blinds that go between the panes of glass in your windows.I would never have to dust puggle hair off horizontal blinds again. That would be...amazing. Roller blinds would be perfect! I have gone through so many standard blinds (from chewing, pawing, etc). Kolchak Puggle, I'm so with you too! I have those in between blinds in my garage and they are great. I dream of having them in my house...I did mention I was dreaming, right?! I think my next set of replacements will be those roller blinds. Oooh - I second the dream of those embedded blinds. They're so cool. I like the idea of roller blinds! Blackout roller blinds are perfect. 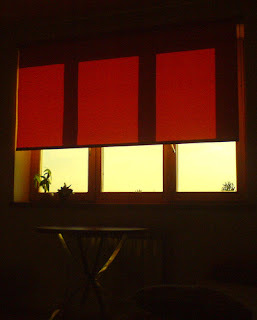 I recommend these roller blinds. I have got them installed in my office. Looks very nice and beautiful.